The connection between fiscal and monetary policy is currently under scrutiny by the German Constitutional Court in the context of the European Central Bank’s (ECB) Outright Monetary Transactions bond-buying programme. Paul De Grauwe and Yuemei Ji argue that most analyses are deeply flawed by the misapplication of private-company default principles to the central bank. ECB bond-buying transforms public bonds into monetary base, and sovereign-default risk into inflation risk. The real question is: What is the non-inflationary limit to money-base expansion? This depends upon the economic situation and is much higher in the current liquidity-trap setting. There is a lot of confusion about the fiscal implications of the government bond-buying programme – the OMT, or Outright Monetary Transactions – that the European Central Bank (ECB) announced last year. This confusion arises mainly because the principles that guide the solvency of private companies (including banks) are applied to central banks. The level of confusion is so high that the president of the Bundesbank has turned to the German Constitutional Court, arguing that the OMT programme of the ECB would make German citizens liable for paying taxes to cover potential losses made by the ECB. We argue that the fears that German taxpayers may have to cover losses made by the ECB are misplaced. They are based on a misunderstanding of solvency issues that central banks face. Indeed, German taxpayers are the main beneficiaries of such a bond-buying programme. The problem arises when these solvency constraints are applied to central banks. This misapplication of private principles has led some to conclude that the loss the ECB (or any central bank) can bear should not exceed the present value of future expected seigniorage gains. Similarly, it is sometimes concluded that a central bank needs positive equity to remain solvent. These solvency constraints should not be applied to the central bank; central banks cannot default. A central bank can issue any amount of money that will allow it to ‘repay its creditors’, i.e. the money holders.1 Such a ‘repayment’ would just amount in converting old money into new money. The central bank (that cannot default) needs no fiscal backing from the government (who can default). The only backing the central bank needs from the government is that it can keep its monopoly power to issue money in the territory over which the sovereign has jurisdiction. With that power granted by the sovereign the central bank is freed from any solvency constraint. Let us now apply these first principles to the issue of how a bond-buying programme can have fiscal implications. We first discuss the situation of the central bank that faces only one sovereign. Then we discuss the problem of the central bank in a monetary union facing many sovereigns. We will consider the case of a central bank that buys government bonds in the secondary market (thus we do not discuss direct monetary financing of government budget deficits). By buying government bonds the central bank transforms the nature of the public-sector debt. When the central bank buys its government’s debt, the debt is transformed; government debt that carries an interest rate and a default risk becomes debt that is a monetary liability of the central bank (money base) that is default-free but subject to inflation-risk. To understand the fiscal implications of this transformation, it is important to consolidate the central bank and the government (after all they are separate branches of the public sector). After the transformation the government debt held by the central bank cancels out. It is an asset of one branch (the central bank) and a liability of another branch (the government). As a result, it disappears. The central bank may still keep it on its books, but it has no economic value anymore. In fact the central bank may do away with this fiction and eliminate it from its balance sheet and the government could then eliminate it from its debt figures. It has become worthless because it was replaced by a new type of debt, namely money, which carries an inflation risk instead of a default risk. This is why it makes no sense to say central banks lose when the market price of the government bonds drops. If there were a loss for the central bank it would be matched by an equal gain of the government (whose market value of the debt has dropped in the same proportion). There is no loss for the public sector. We arrive at an important conclusion: when the central bank has acquired government bonds, a decline in the market value of these bonds has no fiscal implications. The loss in one branch of the public sector (the central bank) is offset by an equal gain in another part of the public sector (the government), leaving nothing to be paid by the taxpayer. Another way to see this is to look at the interest-rate flows underlying bond holdings. Let’s take an example and suppose the central bank has bought €1 billion of government bonds. These have a coupon of, say, 4%. Thus the central bank that keeps these bonds on its balance sheet receives €40 million from the government every year. The bookkeeping practice is to count this as profits of the central bank. At the end of the year the same central bank will have to hand over its profits to the government. Assuming that the marginal cost of managing this bond portfolio is zero, the central bank will hand over €40 million to the government. This is the left hand paying the right hand, so to speak. This bookkeeping practice has led to the perception that the interest revenue is to be considered as seignorage. It is not. There is no profit for the public sector. The profit of the central bank is exactly offset by a loss of the government. Both could do away with this bookkeeping convention because there is no economic substance to these losses and profits. It is literally true that the central bank could put the government bonds ‘into the shredding machine’; nothing would be lost. In our example, the central bank would stop receiving €40 million a year, and would stop paying out €40 million to the government every year. What happens if the government defaults on its outstanding bonds? While default leads to losses for private holders of these bonds, it is immaterial for central bank-held bonds, which are now valued at zero – but they were also already worthless before the default. This is the right hand taking it back from the left hand. Think about it in terms of the interest flows. After the default, the central bank stops receiving interest payments from the government, but by the same token it stops paying these back to the government. Nothing has happened in the public sector. Thus the loss that the central bank is making as a result of the default has no fiscal implications. There is an issue when it comes to price stability and its link to a government default. If the central bank keeps its liabilities (money base) under control, the default by itself will not lead to more inflation. The latter will arise only if the government were to force the central bank to issue more of these monetary liabilities, e.g. to finance current budget deficits that after the default the government cannot finance by issuing bonds anymore. It is sometimes argued that if the central bank has no assets (because of a default by the government), then it no longer has instruments to reduce the money stock. This may sometimes be necessary to reduce inflationary pressures. This argument does not hold water. There are two ways a central bank that lacks assets can reduce the money stock. First, the central bank can issue interest-bearing bonds and sell them in the market. This has the effect of reducing liquidity (money base). Second, the central bank can raise minimum reserve requirements. As a result, the existing stock of liquidity is ‘deactivated’, which has the same effect of a decline in the money base. Things are more complicated in a monetary union that is not also a fiscal union. Here the fiscal implication of central-bank bond buying is more complicated. The crux is the presences of ‘n’ sovereigns. In the Eurozone, n = 17 (soon to be 18 with Latvia). If we could consolidate the ECB and the 17 sovereigns into one public sector, the analysis would carry through unchanged. But we cannot; the Eurozone is not a fiscal union. As a result a bond-buying programme will lead to transfers among participating member countries. To clarify thinking about this problem, assume that the ECB buys €1 billion of Spanish bonds with a 4% coupon. The fiscal implications are now as follows: the ECB receives €40 million interest annually from the Spanish Treasury, and the ECB returns this €40 million every year to the EZ national central banks. The distribution is pro rata with national equity shares in the ECB. The national central banks transfer this to their national treasuries. For example, the ECB will transfer back 11.9% of the €40 million to the Banco de España. The rest goes to the other member central banks. The largest receiver is the German Bundesbank; with its equity share of 27.1%, it would get €10.8 million. Thus in a monetary union (and in the absence of a fiscal union) a bond-buying programme leads to fiscal transfers among countries – but not the one common in the public perception, especially in Germany. An ECB bond-buying programme leads to a yearly transfer from the country whose bonds are bought to the countries whose bond are not bought. It should be noted that the ECB could implement a bond-buying programme that avoids fiscal transfers by buying national government bonds in the same proportions to the equity shares of the participating national central banks. This has in fact been proposed on occassion. But this would not eliminate all transfers because the interest rates on the outstanding government bonds are not the same. In fact the countries with the highest interest rates would in this weighted bond-buying programme be net payers of interest to the countries with the lowest interest rates. Thus even a bond-buying programme weighted by the equity shares would involve fiscal transfers from the weaker (debtor) countries to the stronger (creditor) countries. What happens under a public-sector default? One often hears in the creditor countries that these would be the losers if one of the governments whose bonds are on the balance sheet of the ECB were to default. This is an erroneous conclusion. Returning to our example of an ECB purchase of €1 billion of Spanish government bonds, consider a Spanish default on these bonds. The Spanish government would stop paying €40 million to the ECB, and the ECB would stop transferring this interest revenue back to the member central banks pro rata. The German taxpayer, for example, would no longer receive the yearly windfall of €10.8 million. In no way can one conclude that German taxpayers, or any EZ taxpayer, would pay the bill of the Spanish default – except in the narrow sense that they would no longer be able to count on the yearly interest revenues. There is of course the possibility of an inflation tax. We have noted before that at the moment of the bond buying programme interest bearing debt is transformed into monetary liabilities of the ECB (money base). This by itself could lead to inflation, and thus to an inflation tax that would be borne by all holders of euros. This leads to the issue of how large the ECB bond-buying programme can be without generating additional inflation. Every open-market operation involving the purchase of government bonds creates the potential of inflation because it increases the money base. The key question we have to ask ourselves is how the increase in the money base is transmitted to the money stock. After all, it is the money stock not the money base per se that determines inflation. In Figure 1 we show the evolution of money base and money stock (M3) in the Eurozone since 2004. We find a striking difference between the period before and after the banking crisis of October 2008. Prior to the Global Crisis, the two monetary aggregates move in unison suggesting that the money multiplier (the ratio of money stock to money base) is constant. A 1% increase in the money stock led to an increase of the money stock of approximately 1%. Things are very different during the crisis period. Over the period 2008 (Oct) to 2013 (April), the relation between the money base and the money stock breaks down. The money base increased by more than 50%; the money stock increased by only 7%. This suggests that the money multiplier has dropped dramatically. This dramatic decline in the money multiplier has everything to do with the liquidity trap. Banks, which accumulate reserves as a result of the liquidity injections by the ECB, hoard these reserves. Their degree of risk aversion is such that they do not use their cash reserves to expand bank credit. As a result, the money stock (M3) does not increase. Figure 2 is also instructive. It shows the average yearly inflation rate and the average yearly growth rates of money base and money stock before and after the banking crisis of 2008. Prior to 2008 both monetary aggregates increased at practically the same rates; the yearly inflation was 2.3%. 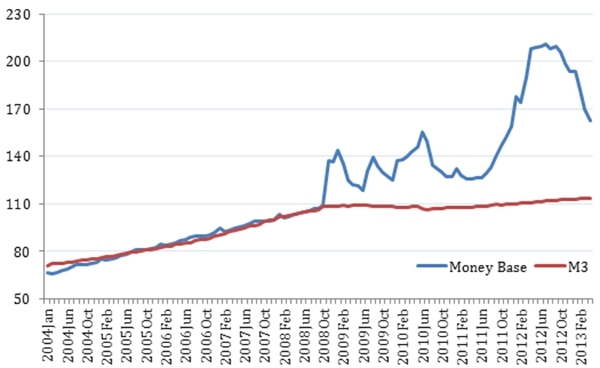 Since 2008 the growth rate of the monetary aggregates diverges dramatically. The money base grows at a yearly rate of 11% while the growth rate of the money stock collapses to less that 2% and inflation drops below 2%. Our interpretation is that the strong increase in the money base helped to reduce the deflationary forces in the economy, rather than being a source of inflation. The previous analysis suggests the following: Limits to a bond-buying programme depend on the nature of the economic and financial situation, i.e. the existence of a liquidity trap. In normal times when an increase of the money base leads to proportional increases in the money stock the limit to a bond-buying programme is tight. If the target for the increase in the money stock is 4.5% (as is the case in the Eurozone where a 4.5% target is assumed to lead to at most 2% inflation) this also means that the money base should not increase by more than 4.5% per year. But then during normal times there is very little need for a bond-buying programme. The situation has changed dramatically since the start of the banking crisis. During the crisis period the limits to the amount of money base that can be created without triggering inflationary pressures is much higher because of the existence of a liquidity trap. How much higher depends on the money multiplier. In another paper, we estimate the size of the multiplier during the crisis period and we conclude that it has collapsed to zero. As a result, there is no limit to the size of the bond-buying programme, i.e. the ECB can buy any amount of government bonds without endangering price stability, as long as the crisis lasts. 1) We assume here that the central bank does not hold foreign currency liabilities. In that case the central bank can be pushed into defaulting on these foreign currency liabilities because it can only issue domestic currency liabilities. This article originally appeared at voxEU. Yuemei Ji obtained her PhD in economics from the University of Leuven in March 2011. Currently, she is associated with LICOS at the University of Leuven. Her areas of expertise are the economics of education and international financial economics. I agree with almost all of your reasoning, but where you are wrong is the impact of default of one sovereign in a monetary union. To stay with your example of a Spanish default, just looking at the interest is not enough, in a monetary union you also need to consider principal. When Spain defaults on say a 1 bn note, it not only stops paying the interest, but also doesn’t repay principle. On the Spanish balance sheet, it gains the entire benifit of the principle it is no longer paying out, while only offsetting it partly with a loss of this principle on the ECB balance sheet according to its shareholding in the ECB. Other countries, however, (say Germany), still get the loss of principle on the ECB balanche sheet according to their shareholding of the ECB, but without participating in the benifit of writing down government debt. I.e. if Spain defaults on a 1 Bn note held by the ECB, that is a loss of 271 MM to the German citizens in the form of an inflationary tax that they pay (like everyone else in the Eurozone), but without getting the same benifits as the spanish citizens (namely reduced debt burden on the state). Taken to the extreme, the sitution would be thus: Imagine the ECB buying all of the spanish bonds and Spain defaulting on all of them. If it were a single country, this public balance sheet would remain the same. In a monetary union, however, Spain would now be debt free while only having to offset that gain with 11.9% of the losses of the ECB.. i.e. their gain is 88.1% of their debt. The rest of the losses is attributed to the public balance sheets of the remaining eurozone country, who bear the cost without enjozing the benifit. This holds true regardless of the fact that the ECB could continue with negative equity or whether or not it leads to measurable inflation.. as it reduces future profits and thus payouts to national budgets and/or through an inflationary tax, even if immeasurably small to the individual.